Alcohol During Pregnancy – A Risk That Should Be Avoided! Pregnancy is a beautiful and exciting time, but also comes with some limitations. In order not to endanger the health and development of the unborn child, the consumption of alcohol during pregnancy must be strictly avoided. 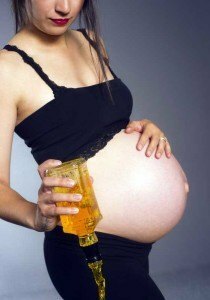 Even though alcohol is a socially recognized indulgence and its consumption in moderate amounts is considered acceptable, the consequences of drinking alcohol can be disastrous for pregnant women. Even small amounts of alcohol can impair the child’s development and cause lifelong damage. Mother and baby are connected by the umbilical cord and placenta, which is why any form of alcohol the mother ingests is also passed on to the baby and enters its bloodstream. Unfortunately, the unborn child requires much more time than the mother to break down this cytotoxin because the baby’s organs are still developing. The worst part: Alcohol and the byproducts of its breakdown interfere with cell division so that the natural development of the organs and brain can be disrupted. The result can be deformities, diminished intelligence, behavioral problems and fetal alcohol syndrome (FAS). The alarming reality: Research from the Robert Koch Institute in Berlin shows that one in five women DO NOT strictly refrain from alcohol during pregnancy. As a consequence, an estimated 10,000 newborns are affected by the damaging cytotoxin every year. These babies struggle with so-called fetal alcohol spectrum disorders (FASDs). The most common of these conditions is fetal alcohol syndrome, with which approximately 2000-4000 children are born every year. Less severe defects are referred to as fetal alcohol effects (FAE). What many don’t know: Alcohol-related defects are about twice as common in newborns as is Down syndrome. These defects usually can’t be cured and persist throughout the child’s life, which is why sufferers are often dependent on others and may require costly assistance in special facilities. Unfortunately, FAS often isn’t diagnosed until much later on—or perhaps not all—because many doctors lack the necessary expertise. According to the National Institute on Drug Abuse, an annual $ 1.9 million are needed for the treatment of children and adults with FAS in the United States. Fetal alcohol syndrome can only be caused by maternal alcohol consumption and is therefore 100 percent preventable by refraining from alcohol during pregnancy. Since no reliable scientific evidence exists about the lowest dose to cause FAS, any consumption of alcoholic beverages during pregnancy should be strictly avoided. But don’t worry: Alcohol consumption that has occurred during the first four weeks of pregnancy—during a time many aren’t aware yet that they are expecting a baby—does not cause defects in the unborn child. This is because the cells don’t begin to differentiate and lose their omnipotence (the ability to replace damaged cells without loss of function) until after this period. So before you give in to your craving for a glass of wine or champagne during pregnancy, remember that even small amounts of this cytotoxin may have serious repercussions for the health of your unborn child, which is why completely abstaining from alcohol is the only safe option.